Hotel Williamsburg turned to Nancy J. Friedman Public Relations to target local and national media to position the hotel as the "town square" of Brooklyn's most energetic and vibrant neighborhood. 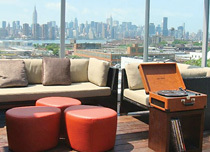 Our client is the Hotel Williamsburg, the first full-service, high-end, boutique hotel in Brooklyn, NY. It turned to us to target local and national media to position the hotel as the "town square" of Brooklyn's most energetic and vibrant neighborhood, as well as a desirable destination for visitors who are both well-traveled and adventurous. What made The Wall Street Journal, which is well-known for its business coverage, a good target for this lifestyle/nightlife story? How did you pitch reporters? The Wall Street Journal's Off-Duty section covers lifestyle incredibly well. We pitched Kevin Sintumuang, editor of the section, by phone and email, offering him a first-look exclusive of the hotel's cocktail venues, while also stressing the hotel's partnership with well-known mixologists, Alchemy Consulting. The competition to secure nightlife coverage in the Journal can be fierce. How were you able to break through that clutter? We showed how the cocktail program at the hotel had four separate areas for drinking, each with its own identity/vibe and cocktail theme/menu. Once Sintumuang agreed to the story, we had him meet with Troy Sidle, Alchemy Consulting member. Sidle walked Sintumuang though a tasting, letting him experience the cocktails first-hand while learning about the concept, ingredients, and more. We also arranged a photo shoot of four signature cocktails - The Revolution, the Vodka Colada, the Seasonal Pimm's Cup, and the Iron Cross - that would be featured at the hotel's rooftop outlet, The Watering Tower. Once you've tasted these cocktails, you're hooked. The half-page story appeared in the Journal a month before the food and beverage outlets opened to the public. It generated strong pre-opening buzz that extended through the formal launch. The print story not only reached the 1.9 million people who read the weekend edition of The Wall Street Journal, but a version also appeared on WSJ 's online site, which has 5.7 million unique monthly visitors. In addition, the hotel's bookings and reservations have exceeded expectations.